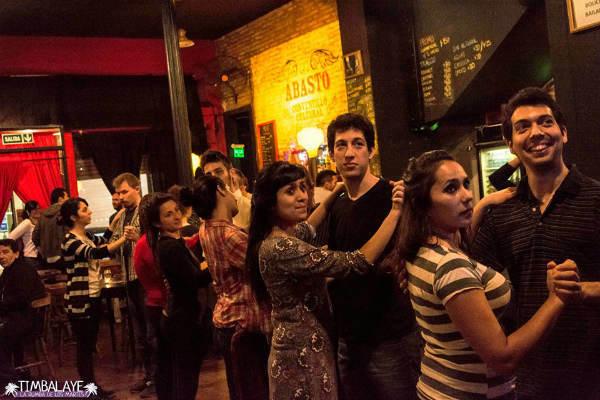 David Fegan braves the salsa halls of Buenos Aires. Published on September 3, 2014 by David Fegan Follow me on Twitter here. “Uno! dos! tres! cinco! seis! siete!” Gabriel Rodriguez, the Timbalaye Rumba Tuesdays salsa teacher at Conventillo Cultural Abasto, shouted while punching the air. While I initially laughed at Gabriel’s head mic – which was entirely practical; his dancing was not so funny – he is a pro. My dancing on the other hand, as well as two of the three friends I came with, fell into the first category of laughable. So it is no surprise that two of us were corrected quite vigorously by Gabriel during the warm up of our first salsa class in Buenos Aires. “Uno, dos, tres, cinco, seis, siete,” the group of roughly 30 men and women said routinely as we repeated the first steps Gabriel taught us across the waxed wooden floor in the personal, urban, half retro bar, half dance hall surroundings. We initially learnt the first salsa steps without music. The women moved around the circle of men in a lazy Susan fashion, as partners rotated every few minutes on Gabriel’s instruction, making it a salsa meet and greet of sorts. In line with this analogy, some were fantastic dancers, most were of a respectable level, and then a select few — whose uncultured, concrete feet and hips smashed recklessly around the dance floor — created a steep downhill trajectory from there. The age of the group ranged from late teens to fifties, generally speaking. By my calculations, there was at least Spanish, German, English, Australian, Brazilian and Argentinian representation in the room. However, aside from my friends, I didn’t meet any fellow English speakers, so with my modest understanding of Spanish and salsa it was a thrilling experience in misunderstanding, terror and failure, but fun nonetheless. Some of the ladies were easy to dance with, conversational, personable, and encouraging. It was these people who elicited the best from beginner’s such as myself, as not feeling as though I was on trial was key. “De donde eres?” said one lady I danced with, picking up on my foreign accent and non-existent Spanish vocabulary. I should have said “y tú” . . .
“Bueno,” said another lady after we loosely accomplished a ten step move shortly after. That I’m afraid to say, were the high points for me. In other moments when the steps were forgotten and the beat subsequently missed, I fell off the rhythmic path so woefully that I would have had a better chance of finding my way unscathed out of the Grizzly Maze in pitch black. In these moments I chose one of two paths: the first being to wait for the routine to restart and jumping back in with the enthusiasm and touch of a child — salsa is quite personal and I didn’t hold the women I was dancing with with the authority required, providing an apologetic limp-wristedness so as not to offend more than I already was. The other road I chose was to clam up completely on the dance floor, suffocated by my anxiety as though by body was in a full size Chinese finger trap, with my modest Spanish not allowing me to escape. So I reenacted a train crash that has finally settled, laughing to try and ease the situation and shaking my head in woe, watching the others for visual cues on how to do the steps and waiting for my next partner to come around. I was unfortunate to find myself in this later situation twice with one girl, my earlier failings possibly informing the next. I felt sorry for her and sorry for me too. Eventually I was spat out of the circle, deciding not to fight it I went and sat down to watch with a beer. I found myself having enjoyed the sheer terror of the situation, of feeling real fear and admiring the simple yet complex beauty of those dancing the salsa. The salsa beat was infectious and permeated every limb of my body as Gabriel’s shouts still sharply punctuated the air with the same enthusiasm of an hour and a half earlier. I had already decided I would be back next week. Read about the experiences of the other students here.